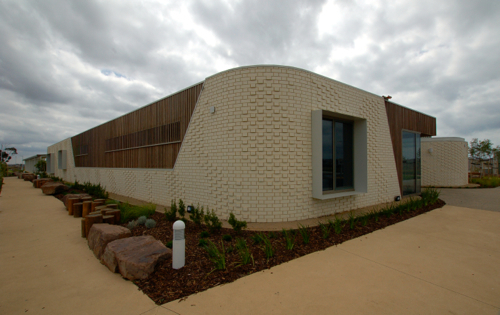 Projecting bricks form a subtle image of ripples undulating along the walls of a new community centre. My design for the brickwork is drawn from the landscape that surrounds this prizewinning building, a place where cloud shadows slide across windswept grasslands and bird-thronged wetlands. For the inaugural community open day I ran a paper-folding workshop in which visitors created a flotilla of paper boats to sail the ripples on the walls. 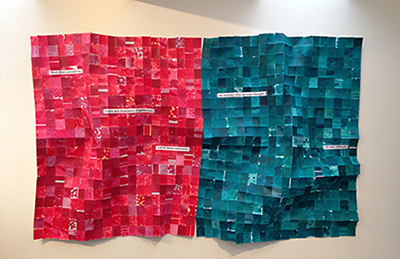 Tidings is both painterly and sculptural. Its lyrically topographic surface is made from hundreds of handpainted squares that flicker with gestural marks and glow with luscious colour. And then sometimes there are moments of perfection and in these moments we wonder why we ever thought life was difficult. 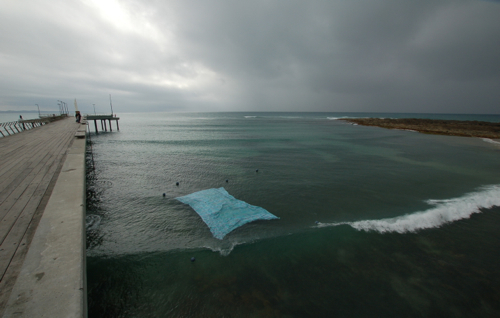 A temporary installation in the water beside Lorne Pier, the buoyant panel floated undulating in slow motion, gently bunching and spreading as swells rolled through. Its woven zigzag pattern echoed the rippling ocean waters extending to the horizon, while phosporescent lettering glowed ethereally across the surface at night. 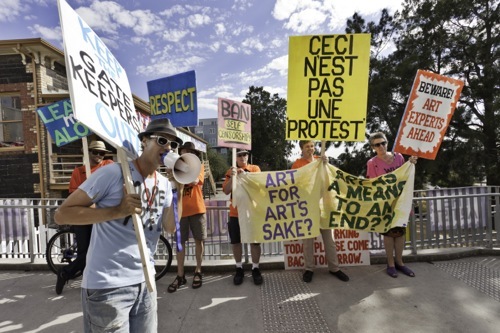 A tongue-in-cheek picket line installed to coincide with the 'Spectres of Evaluation' conference. The slogans on the placards playfully engage with the issues addressed in the program of papers presented at the conference. Our aim was to draw attention to the paradoxes and questions raised by socially engaged art practices; the disjunction between art, audiences and art language; and to highlight gaps and overlaps between art and real life. On National Tree Day 2013, Burke and Lavarack set out on an expedition to hug as many street trees as possible in an eight-hour period. Suitably booted and provisioned, the explorers followed a meandering route through Melbourne's CBD, hugging then labelling hundreds of trees. 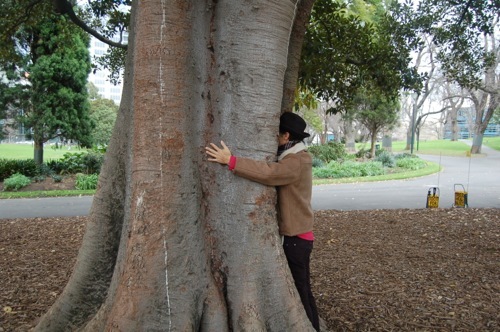 The circumnavigation became a large-scale 'embrace' that echoed the individual acts of tree-hugging they carried out.